A gang of poachers entered a high-security zoo in Itanagar in the Arunachal Pradesh state of India, and hacked a tiger to death last night. The poachers tranquilised the six-year-old tigress before entering its enclosure and cutting it into six pieces. The arrival of security guards prevented the poachers from carrying away the mutilated animal. The poaching and smuggling of tiger body parts is common across India. The animals are prized throughout East Asia in general and China in particular for the supposed medicinal value of their body parts. Tiger numbers have shrunk alarmingly in India in recent decades. A 2011 census counted about 1,700 tigers in the wild. A century ago there were estimated to be 100,000 tigers in India. There have been attempts at poaching animals in the zoo before, officials say. In February 2006, three tigers and a leopard were poisoned by unknown people. One tiger died, while the other two other animals survived. In June 2006, 30kg (66lb) of tiger parts - mainly bones and nails - were seized from a vehicle belonging to a police officer in Assam state. This is again a very unfortunate incident of an innocent animal being killed because of the greed of humans. There must be tight security arrangements to save these helpless animals from the cruel hands of poachers. 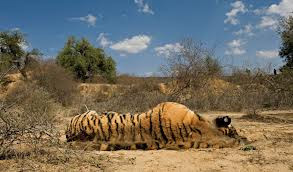 Else, one day there will be no tigers or any other majestic animal left on the earth.